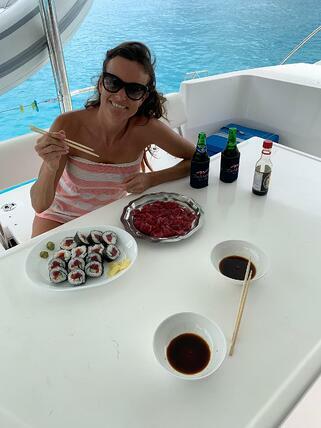 If your ideal charter is one where each night you’re anchored in secluded bays, enjoying a freshly self-caught tuna for dinner straight off the barbeque, with some of the world’s most stunning beaches as your backdrop then the Seychelles is the sailing ground for you! Myself and my husband have just returned from what I can say without doubt was the best charter I’ve had to date. 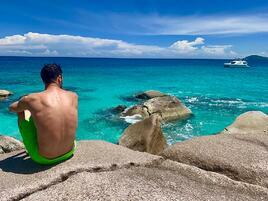 We spent two glorious weeks cruising around the Seychelles aboard The Moorings 434 Power Catamaran. When I go sailing I like to avoid the crowds and tend to spend a huge amount of time aboard the boat rather than seeking out restaurants and towns ashore. I love to be anchored in beautiful spots where I can wake up and start my day by jumping straight into the water and then take to the paddle board for a cruise! My husband is an enthusiastic novice fisherman who proved his weight in gold on this charter; catching enough fish to feed us for the entire trip, in fact we had so much we had to give huge amounts away to our neighbouring yachts each evening. Our fishing success was a huge contributing factor as to why the holiday was so successful. Fishing brought us lots of entertainment and laughter, not just when catching these sea monsters and trying to get them aboard but also with the work involved to gut and fillet them! We ate our fish every which way you could imagine; ceviche, grilled, sashimi and sushi rolls to curried! Aside from all the breath taking scenery you’d imagine to find in such a renowned part of the world I was pleasantly surprised with all that could be found ashore to give you a nice break from being aboard when required. 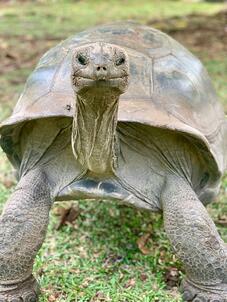 Most of the islands have trails to walk and explore the lush vegetation home to a range of birds and on some of these islands you’ll find giant tortoises which are a must see! 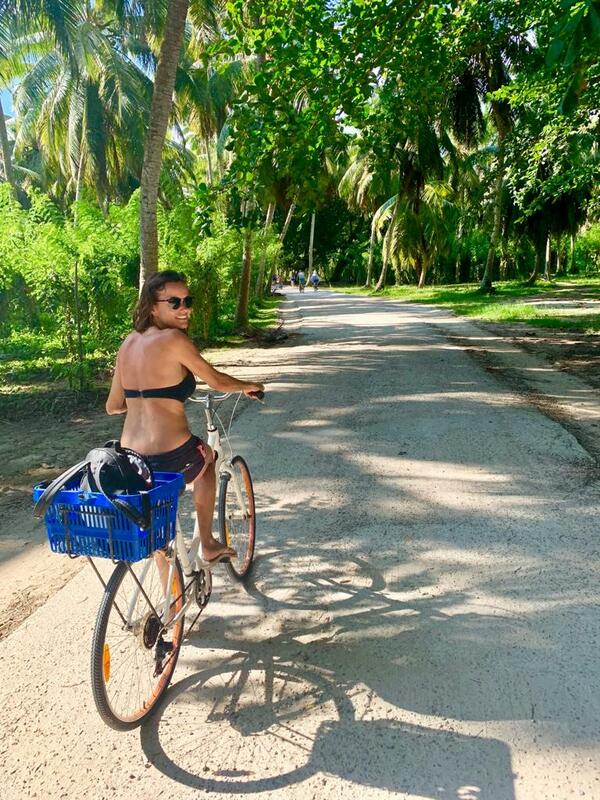 La Digue island has many bike rentals where you can cycle at your own pace down the length of the island stopping to sample the local food from various shacks till you reach the most famous beach in the Seychelles; Anse Source d’Argent! 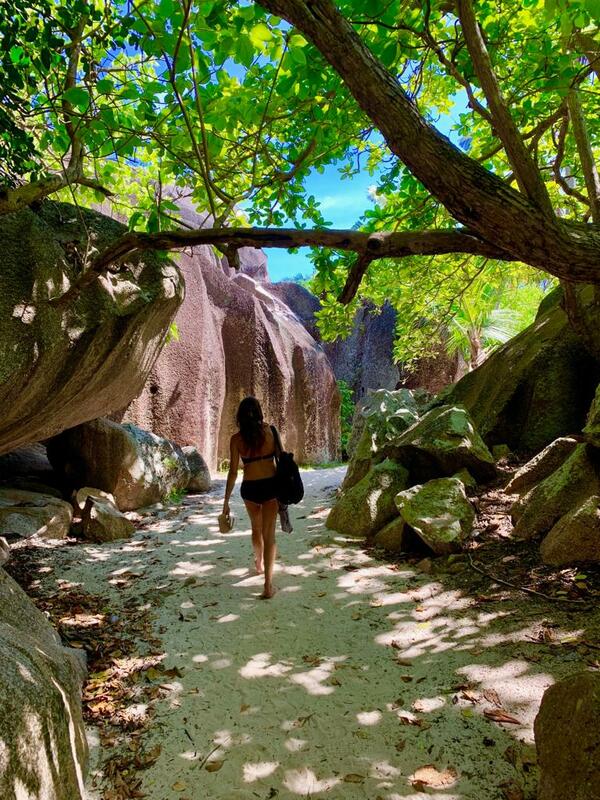 The Seychelles is home to the biggest nut in the world; coco de mer which reaches up to 50cm in diameter and can be found in the Vallee de Mai national park on Praslin. 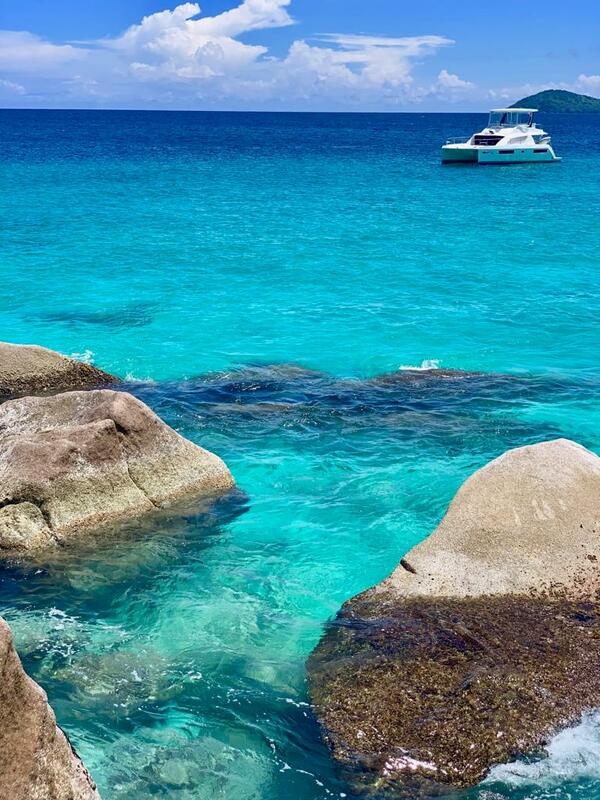 From the UK the Seychelles is extremely convenient to reach with direct BA flights from Heathrow to the main island Mahe (SEZ). The flight times are great meaning no early starts and some of the prices are very reasonable. The base is just 15 minutes from the airport and you’ll arrive in the morning with plenty of time to do your hand over, provision at the main super market and set sail that same day. 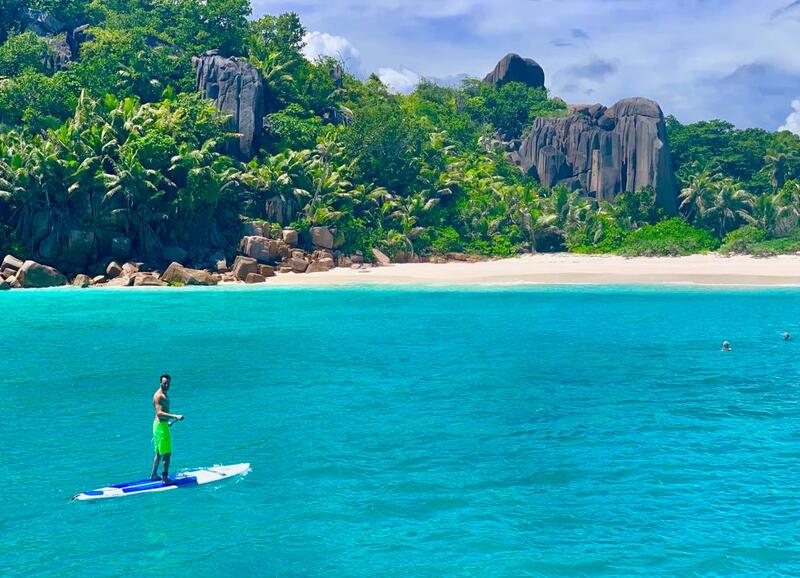 The Seychelles is a year round destination with temperatures not dropping much below 30 degrees and has 2 opposing wind directions through the year. From December to April the winds blow North Westerly and from May to November they blow South Easterly. The North Westerly winds are lighter, picking up to about 10-15knts at day break. 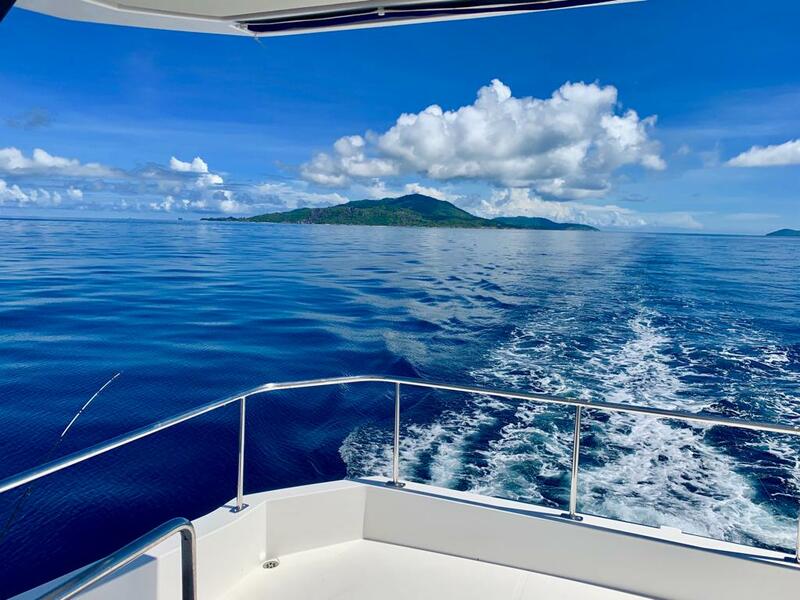 December to March brings some squalls but overall the North Westerly winds bring the flatter and calmer periods to visit the Seychelles. The South Easterly period is drier but brings a larger swell as winds average 15-25knts. The flattest period are the months of April and November which are ideal of power cats as these are generally near windless. There’s a tidal range of about 1.5m and although it’s mostly line of sight navigation there are some rocks just below the surface which mean you have to take caution. 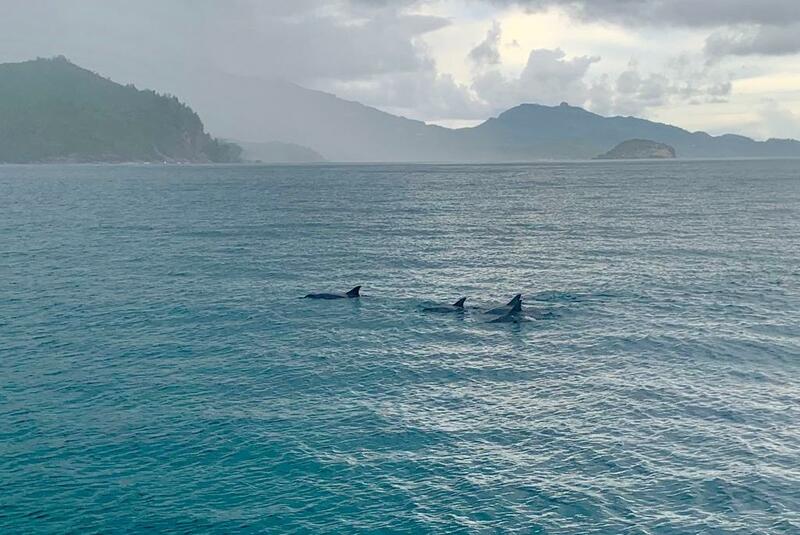 In addition to this there is a rolling swell in the Seychelles which increases with the winds from June – October; a period to avoid especially if sailing with children. 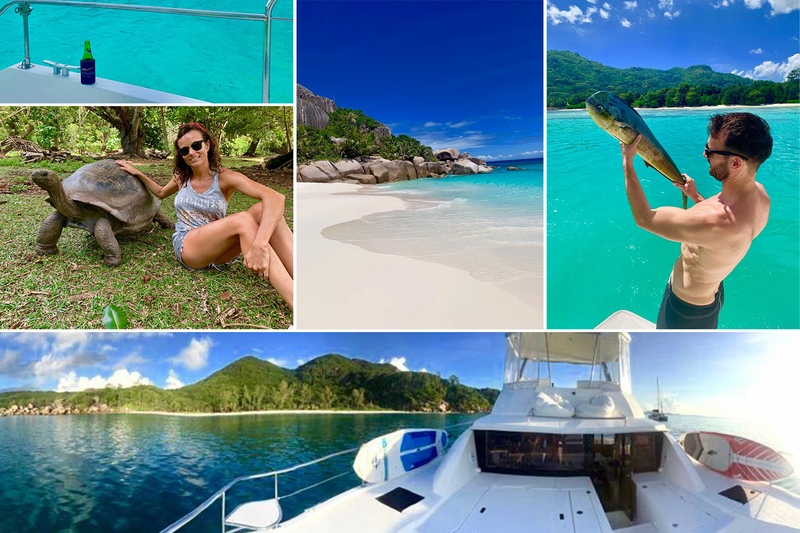 The Seychelles really is paradise for those who have the same requirements as we do for a holiday; getting away from the crowds and being at one with your boat and the amazing scenery! However I would stress that if you are not willing to cook aboard daily and your ideal holiday means a break from the kitchen with regular meals ashore then this isn’t the location for you as restaurants are hard to find. 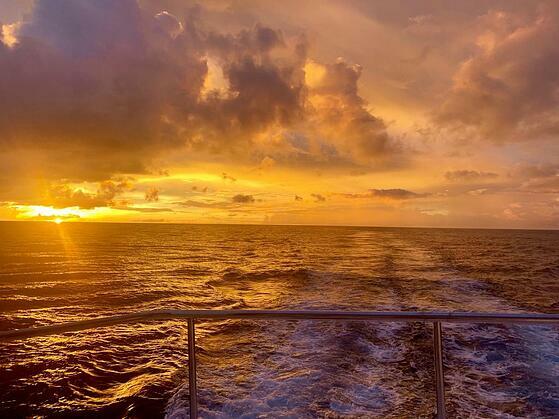 Each night you will anchor in the most idyllic settings with the exception of a couple of locations where you will also have a line ashore, however the holding for anchoring is good and I felt very comfortable each evening. One of the great things about this area is the lack of mooring fees; you are only required to pay fees when anchored in the national parks which typically you would probably only wish to do 2 or 3 times in a 2 week period. The beauty of being at anchor is the huge amount of sea life surrounding you at all times which makes for some spectacular snorkelling! On at least 5 occasions we had dolphins just hanging around with us at which point we’d quickly jumped on our paddle boards for a closer look. My husband Niall was lucky enough to have them swim under his board a few times whilst they slowly rotated to belly up giving him a good look over! There are a few small super markets on various islands around the Seychelles where you can easily dinghy ashore for provisions but we found there was a lack of fresh meat and fish to purchase apart from at the main supermarket close to the base, so stock up well in Mahe before you depart! Sylvain and his team at the base are extremely friendly and helpful. Before you depart the UK you can arrange the rental of your paddle boards and fishing gear! 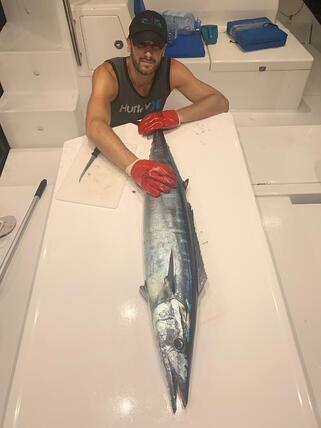 You would be missing a serious trick if you didn’t trawl when sailing as the waters there are full with fish year round and you can eat anything you pull out. We caught lots of tuna and job fish daily, and if you’re lucky like we were you’ll catch a big dorado or wahoo too (although my husband would of course say this was more down to skill than luck!). 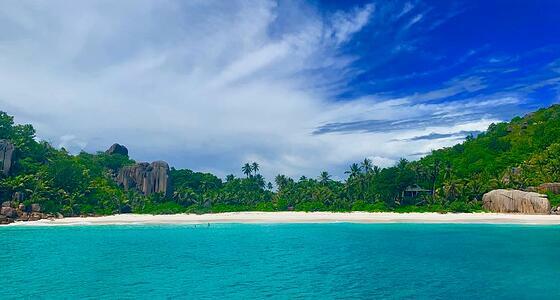 Our favourite overnight anchorage was Petite Anse on the South Eastern side of La Digue which is only doable when you are in the NW wind period. There are 3 bays to choose from here, all of which are extremely quiet and you may find yourself totally alone or at the most with two other yachts. These bays can only be reached by boat or foot and are completely untouched and spectacular! 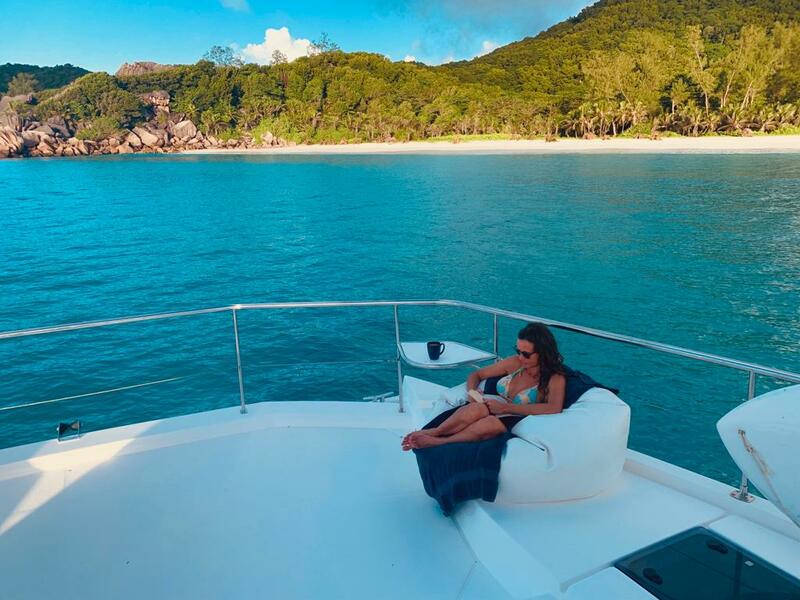 If you need a restaurant and some shore time I really recommend anchoring in Port Launay bay which is located on the South Western side of the main island Mahe. You can anchor in this bay in both wind directions and the water is extremely flat. Located 20 minutes on foot is a fantastic swanky restaurant called Del Place. If you call them they will arrange a taxi to collect you which is a good idea if it’s dark or if it’s during the hottest part of the day. We loved it there and enjoyed two very long lunches over a beautiful bottle of crisp white wine. I suggest having the fish and chips “Seychelles style” which is made with huge chucks of job fish, its epic! Just a short walk from this restaurant is a beautiful waterfall which you must see and swim in. The very friendly locals will be delighted to tell you where it is! Want to hear more then please come and see us at the London on Water Boat Show at St Katherines Dock 9th-12th May 2019! Provisioning – Best done at the large supermarket 10 minutes from base rather than at the marina for more variety and better prices. The base will arrange a taxi for you. Flight duration – 10 hours direct with BA from Heathrow. Nancy Poyner has been part of the Sunsail Yacht Sales team for 3 years. 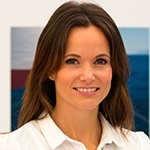 Her experience in the Yachting industry is extensive having developed professional experience as Yacht Skipper, in Charter and formally at the dinghy clubs. Nancy is also well travelled and a keen windsurfer, kite surfer and paddle boarder. She’s fast on the water, so just try and keep up!